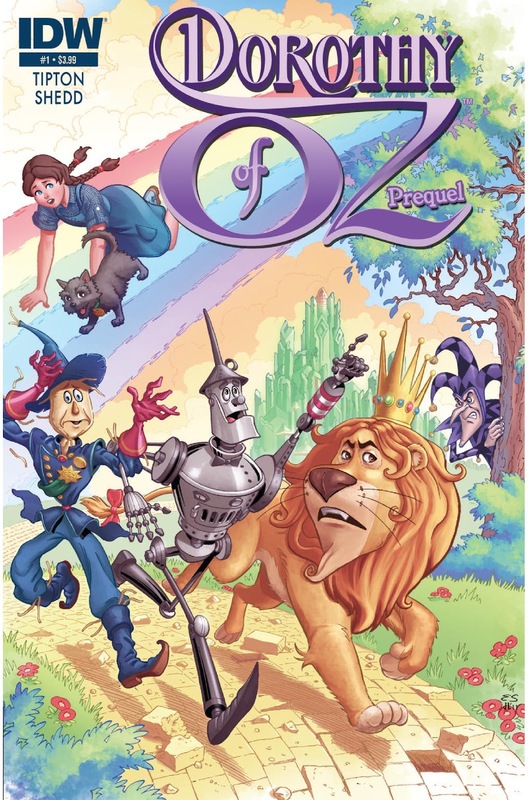 The Fellowship was fortunate enough to obtain a copy of DOROTHY OF OZ PREQUEL #1 from IDW Publishing. The story is written by Denton J. Tipton with art by Blair Shedd. The mini-series is a prequel to the upcoming animated movie from Summertime Entertainment. The events of the mini-series takes place after the classic story and focuses on the characters after Dorothy went home. The Jester, who is the Wicked Witch of the West’s brother, takes over her castle and begins his quest to rule Oz. He starts by recovering his sister's broom, then uses her powers to flood Munchkin City and kidnap the mayor to be a member of his “court” that he is assembling. I’ve never read any of the books, but sometimes wondered about further adventures of the characters. This issue has me interested in checking out the rest of the mini-series and the animated movie. The choice of a jester (which can be funny as well as evil) for the Wicked Witch of the West’s brother is intriguing. Blair Shedd’s artwork is beautiful and totally appropriate for this series. I must point out that Joana Lafuente did the colors and created such a great atmosphere. DOROTHY OF OZ PREQUEL #1 is in comic book stores now or available at www.idwpublishing.com.